British rule in India dated from 1757, when the British East India Company, under Lord Clive, defeated the Nawab of Bengal at the Battle of Plassey. British rule did not end until the Indian Independence Act of 1947 was passed. In the almost two hundred years between Plassey and the Independence Act, India suffered a series of devastating famines. While perspectives on the causes of the famines vary, there is little doubt by historians that colonial policy contributed to the enormous loss of life. India was once called the Jewel in the Crown of the British Empire. Great riches were extracted from the colony. Many landed estates were financed by wealth gained from the subcontinent. Millions of lives may have been the price India paid to produce this profit. The Famine of 1876 was not the first or last suffered by the Indian people. 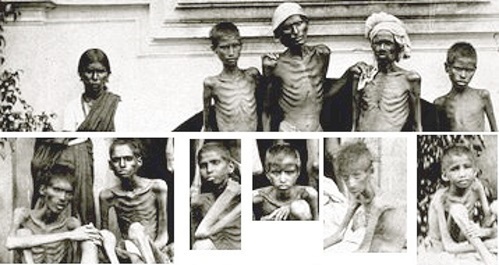 Also called the Madras Famine, it occurred essentially in southern and southwestern Indian states. Most historians blame British colonial policy for contributing to the suffering. While some observers suggest that famine would have occurred in any event because of natural conditions, there is little doubt that British actions turned the famine into a greater catastrophe than it might otherwise have been. This picture is cropped from a larger photo taken by Willoughby Wallace Hooper in 1876. The larger photo was not used here because it was even more graphic. The images of emaciated people in the photo above were recorded during the famine, which lasted approximately from 1876 – 1878. It is not known whether any of the people in the photo survived. The 1876 Famine is distinguished from some that came before in that there is an extensive photographic record of the events. Estimating the total death toll of the famine is difficult. Some historians say five million perished; others put the number of deceased closer to ten million. In addition to those who died, millions suffered severe malnourishment, the effects of which likely lingered for the rest of their lives. It is believed that long-term and short-term policies of British rule helped to precipitate the famine and to exacerbate its drastic effects. Grains that could have fed the people were routinely sent out of the country. Lands that might have grown food for the people locally were converted to plantations dedicated to cash crops. These crops were sent abroad. The Viceroy of India at the time of the famine, Lord Edward Lytton, did little to alleviate suffering. It is overwhelmingly the judgment of history that Lytton’s actions caused the death of millions. Lytton declined to institute an aggressive relief program. Not only did he not distribute sufficient foodstuffs to the starving, he also continued to export grains that could have fed them. At the height of the famine, a record amount of wheat (6.4m hundredweight) was exported to England. It is certain that Lytton was motivated by a desire to see that India continued to yield a profit for the Crown; however, there was likely a secondary motivation, perhaps as strong. Lytton was being true to a philosophy called Social Darwinism, which held that in a natural order, the strongest survive and the weakest are winnowed out. It is this winnowing, Social Darwinists believed, which is nature’s way of strengthening the population as a whole. By allowing millions to starve, therefore, Lytton was accommodating a natural process that in the end would be of benefit to society. After his service in India, Lord Lytton enjoyed a distinguished diplomatic career. He became Earl of Lytton and Viscount Knebworth. Among his contemporaries he also enjoyed a solid reputation as a poet. Upon his death in Paris (1891) he was granted the extraordinary honor of a state funeral. The lithograph by William Digby is based on a photograph by Willoughby Hooper. Digby wrote about the Great Famine in his book, The Famine Campaign in Southern India, 1878. This picture shows grain piling up on a Madras beach as it is readied for export to England. The material in this essay was modified to match the reading skills of an adult audience. The original essay was written with vocabulary and sentence structure that were less challenging. While it is true that Britain once was the greatest sea power on earth and had an empire that stretched across the world, other European nations also had colonies. In each case, there was evidence of indifference to life and the cultures of indigenous peoples. The British, for a time, were more successful at conquering and colonizing, but no more brutal. Italy, for example interned thousands in a Libyan concentration camp and has been charged with using poison gas in its attempt to secure African colonies. France routinely used conscripted labor in their various colonial enterprises. The stories of indigenous peoples under European colonialism could fill many books. A. G. Moore has attempted to tell some of those stories in richly illustrated book (172 pages), Exploration and Conquest: Stories of Indigenous Peoples. This book can only touch the surface of a complex and tragic history, but it does provide readers with a true impression of the European colonial era and the toll it took on indigenous people around the world.